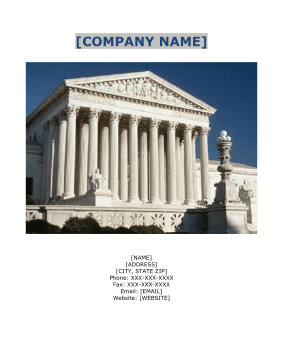 This free, printable business plan helps companies that offer legal search services to manage, operate and administer the business, as well as organize income and capital. [COMPANY NAME] is located in [CITY, STATE] in the [CITY] ([STATE] and [STATE]) Metropolitan Area. It was founded in 1990 by [NAME]. The company provides a service to law firms and other entities, which need attorneys and a service to attorneys seeking employment. [COMPANY NAME] mission is to deliver quality legal search services with the highest level of professional responsibility. It has achieved such a high level customer satisfaction that most of its business comes from its word-of-mouth reputation. [COMPANY NAME] matches entities in need of attorneys and attorneys in need of employment. With a $288,000 investment, [COMPANY NAME] will be able to improve and expand its services in the greater [CITY] area and beyond. • Deliver quality legal search services with the highest level of professional responsibility. [COMPANY NAME] was founded in 1990 by [NAME]. He has 21 years of experience in legal recruiting, including 20 years as owner of this company. [NAME] also served as Assistant Dean of [STATE] Law School prior to becoming an attorney recruiter. [COMPANY NAME] is a S-Corporation owned solely by [NAME]. [COMPANY NAME] was founded in 1990. It has prospered throughout most of its history. However, recently, the bad economy has had a terrible effect on attorney hiring. In 2007 [COMPANY NAME] had seven attorney placements. In 2008 and 2009 there were only three.